Our Brightening Concealers are the perfect choice for hiding little flaws, and work wonderfully as a matte highlighter. They contain silica, and our HD microspheres so they blend beautifully, help blur fine lines, and give you a radiant glow. They're great for setting cream concealers, or you can use them all by themselves. Shade Selection: Shade #1 is great for HD Foundation Shades in the 10-30 range. Shade #2 is for 40-50, Shade #3 is for 60-70, and Shade #4 is best for 70-80. In general you want to choose a color that is two shades lighter than your foundation, or one shade lighter than your concealer. Full Size is 1.5 teaspoons in a 10 gram sifter jar. Samples are 1/8 teaspoon in a 5 gram sifter jar. I’ve tried MANY concealers and under eye brightners and because of my oily skin most settle into my creases, melt off, or plain run. So, I decided to try and find a powder concealer and remembered silk naturals carried some. Well, for me, this is the winner. Not only is the price fantastic, but #2 is PERFECT on my tan skin, it does brighten my under eye (I’ve received so many compliments), but it doesn’t crease or settle. When my skin is dry, I did see it settle into my creases and make the area look dry so I started using eye serums and/or eye creams and problem fixed! Thank you so much Silk Naturals!! This is perfect for my upper inner eye corner and lid. It neutralizes some reddish darkness I have there I have and really makes me look healthier and better rested. I like the peach cream stick for the under eye are, but love the lightness of this for the upper area. Works great at concealing (have been using #1 and am going to test #2) but sometimes settles in places and cakes a bit, especially around my nose and I’m not sure why. I have horrible dark under-eye circles that will probably never be completely tamed, but this brightening concealer has been the best product at lessening the darkness under my eyes. In combination with the cream stick concealer, it is a force to be reckoned with. Great product and way more affordable (and way more natural) than Ben Nye's Banana Powder. My new perfect under-eye concealer! I had been religiously using Sleep In a Jar in Light Peach but I decided to give this a whirl. I wear G30 in the HD cream foundation and this is a MUCH better color match for me since it's on the yellow side. It brightens my under-eye area without looking cool peachy-white or over bright. 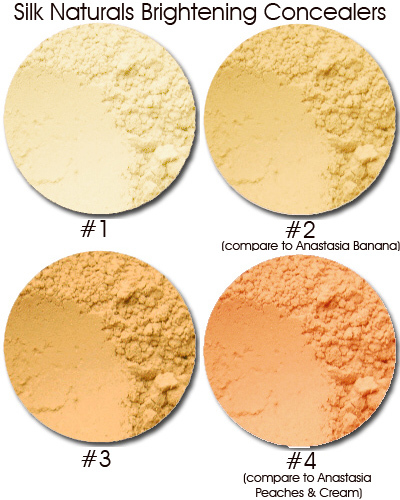 Also, due to the yellow, color-correcting tint, you need less of it, so that decreases the potential to look too powdery. On that note, too much can look TOO yellow, so use a light hand if you're a pale gal like me. Thanks for looking out for us pale-but-warm-undertoned girls! !